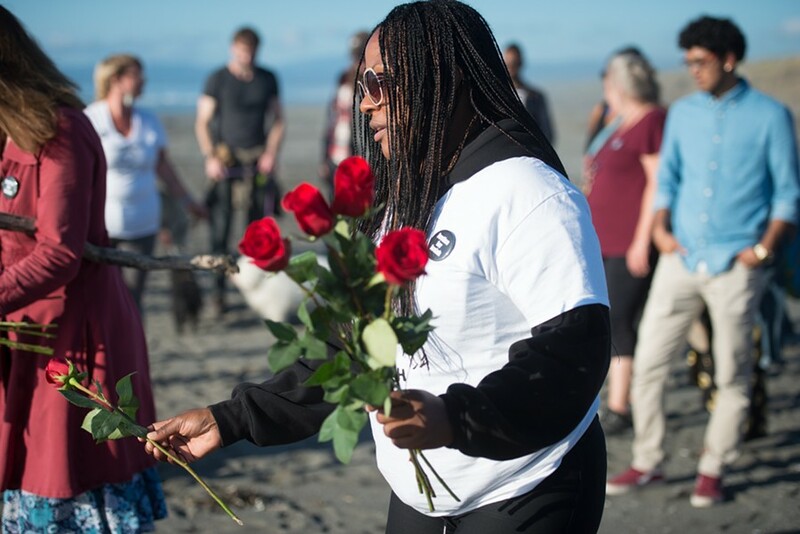 Charmaine Lawson places roses in two hearts drawn in the sand at a recent vigil held for her son. When Charmaine Lawson, the mother of a slain Humboldt State University student, read that the Eureka Women’s March was cancelled amid concerns that it had been “overwhelmingly white,” she was surprised. Organizers cancelled the march Dec. 28, released a statement saying their committee needed more diversity to proceed. They are now planning a new march in conjunction with International Women’s Day on March 9. In the wake of the cancellation, new organizers, including former Eureka City Councilmember Linda Atkins, took it upon themselves to coordinate this years Jan. 19 Women's March. Charmaine Lawson’s son, HSU sophomore David Josiah Lawson was 19 when he was fatally stabbed at an off-campus party on April 15, 2017. Kyle Zoellner, of McKinleyville, was arrested after the killing but the charges were dropped after a judge ruled there was insufficient evidence to hold him to stand trial. On Nov. 9, about a year and a half after Josiah Lawson’s death, the Arcata Police Department turned over its investigation to Humboldt County District Attorney’s office, which is still reviewing the case, awaiting additional information on forensic testing from the Department of Justice. A candlelight vigil was held for Josiah Lawson on Tuesday at the courthouse. Charmaine Lawson said she wanted to organize a march and rally to compliment the Eureka's NAACP’ Martin Luther King Jr. commemoration, so she reached out to all of the local organizations representing communities of color and decided to do so. “What better way to honor Martin Luther King Jr. than to have a march for justice?” Charmaine Lawson asked. Charmaine Lawson reached out to the Eureka NAACP, Centro del Pueblo and Seventh Generation Fund for Indigenous Peoples. Together with the Justice for Josiah committee, all the organizations are sponsoring the “People’s March and Rally for Justice” on Jan. 21. 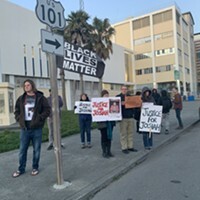 The rally will start at the Humboldt County Courthouse (825 Fifth St. in Eureka) at 10 a.m. and end at the Adorni Center for the Eureka NAACP’s annual Martin Luther King Jr commemoration. Renee Saucedo of Centro del Pueblo said there will be no police presence at the rally, which will see rally goers walk on city sidewalks down to the Adorni Center. Eureka Police Chief Steve Watson said he heard about the rally online and then directed his captain to reach out to organizers to help facilitate and ensure participants’ safety but hasn’t been able to reach anyone. Watson also said police would only be present to ensure the rally and march go smoothly with traffic control. Residents from various communities are expected to speak at the rally and remind the community that racism and injustice still exist in the county, according to a Justice for Josiah press release. After the rally, the Eureka NAACP will celebrate the life of Martin Luther King Jr. at the Adorni Center with a ceremony honoring past Eureka NAACP leaders, musical performances and more. The Eureka NAACP is sponsoring the event in collaboration with the city of Eureka. “I really want to encourage people to come out and support communities of color and stand in solidarity with those who continue to face structural racism and injustices in our community,” Saucedo said. Charmaine Lawson has expressed frustrations with Humboldt County District Attorney Maggie Fleming for not making a charging decision in her son’s case. She continues to return to Humboldt County time and time again, not only to find closure but also to help out in the community and with HSU students, said Jill Larrabee, who helps with the Justice for Josiah committee. Charmaine Lawson has reached out and made connections with community members and wants to continue to return to Humboldt County, even after her son’s case is resolved. One of Charmaine Lawson’s goals is to make a housing project for students experiencing homelessness, named “Josiah’s House,” a reality.